Today is my third grandson's birthday. Samuel is now seven years old. He has two older brothers. 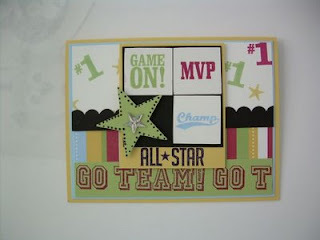 All three of them are into sports so I had to buy all the sport theme stamp sets that Stampin'Up sells. These stamp sets are all on pages 82 and 83 of the catalog. This time I only used the Sporting Set to make his cute card. This set of eight are all words. They go very well with the football, tennis, basketball, baseball, hockey, soccer and golf sets also available. With seven grandsons the above sets will provide me with unlimited ideas in the years to come. 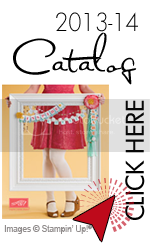 This month there are two great promotions.. Hostess a workshop for 350.00 and get an additional free stamp set from the preview catalog along with the regular free items and stamp sets. And to help make that goal you and friends can get 20% off birthday stamp set from pages 62-65 when 20.00 is spent on other merchandise. Remember, you now can shop 24/7 on the SU website.